Your upcoming cross-country move might, at the same time, excite and distress you. Whether you are moving an office, your family, or just yourself, the labor of a national move is intensive. From long hours packing to lifting dressers up and down flights of stairs, you could be left exhausted at the end of the relocation process. You need a reliable national moving service that can reduce your stress and smooth out your whole move. Great Guys Long Distance Movers helps you identify a nationwide moving company with ample experience and a passion for making moving easy. Whether you are looking into a residential or an office move, make sure the movers you choose are licensed and insured. Your nationwide mover should have your best interests at heart. They should be able to personalize your move to your wishes. With our partners, you can choose from a wide variety of national moving services, like packing and unpacking, furniture disassembly, and transportation of various items. Select a professional mover who has proven itself in providing excellent cross-country moving services. Your national relocation specialists should be able to handle moves of every scope and size. No matter where you are planning to settle down, your professional movers will work hard for you until you are settled and comfortable in your new home. Find out how much your move will cost with a free quote now! Your nationwide move entails significant prep and planning. You might feel a little overwhelmed when you consider the costs and labor that come with a national relocation. Below we explore the pros and cons of some of the most popular ways to navigate a move across the country. Hopefully, using some of these strategies will save you time and money on your relocation! 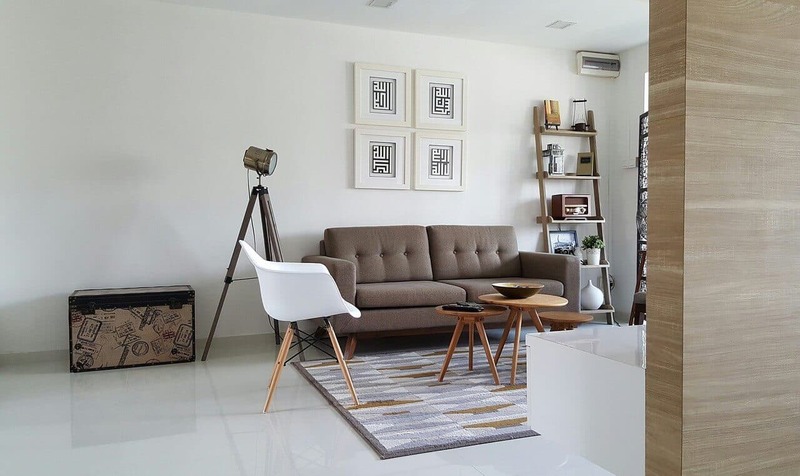 Taking a minimalist approach will make the whole move easier and can even put cash back in your pocket. If selling most everything you own makes financial sense for you, there are some significant advantages. You can make money: Do the math based on what you really need in your new home and what you could sell for some extra cash right now. In some cases, you could make money from selling all your belongings before moving. It all depends on what you use and what you will need in the new residence. Less labor involved: And of course, if you are making a DIY move, the process will be physically much easier, from packing to unloading. Buying new furniture: If you get rid of almost everything before moving, it may be expensive to furnish your new place. Make sure to look at your new floorplan and think through what you’ll need to fill the space. Takes time: While you won’t be spending hours packing up your stuff, you will have to spend time negotiating sales on Craigslist or making runs to your local thrift store to drop-off donations. If you’re moving on short notice, this may not be the ideal moving method for you. Sentimental items: If you plan to drive just a single car across the country, you may not have room to bring all your most cherished items with you. Weigh the emotional cost of having to part with some of your favorite things. So, if you want to avoid expensive professional moving fees or enjoy a more straightforward DIY move, think about selling most of your stuff. Naturally, this isn’t the right approach for everyone. Price out your old belongings, look at your new floorplan, and be realistic about what you need. Don’t forget to take measurements before you move! This planning will help you decide what to keep and what to sell. It is optimal to make plans for the aesthetic and function of each new room while you think about what you’ll bring along. Finally, consider national moving costs, especially for specialty items like moving artwork or instruments. If you’re not ready to part with almost everything you own, but don’t want to pay the price for professional movers, renting a moving truck might be the perfect middle-ground. Here are some things to keep in mind with using this moving method. Flexibility: Renting a moving truck doesn’t mean the same thing for everyone. You might drive the truck yourself and have a family member drive your other vehicle(s) to your new state, or you might hire a professional to transport all your belongings so that you can drive your car or fly. You can hire professionals to load and unload your things but then drive the truck yourself, or you can do it all solo. Renting a moving truck means you have lots of options for your move. Control: Some people prefer transporting their valuables themselves. Renting a moving truck instead of hiring professional movers means your items stay in your control and sight the whole time. Affordability: Many people choose to rent a moving truck versus hiring a professional moving service because they can save money. Look into the costs and associated benefits with professional movers versus a truck rental. Extra Work: Of course, renting a truck and going it alone means a lot more work. Renting the truck, packing and loading it, and driving an unfamiliar vehicle adds loads of complexity to your move. Moving is already hard work, so you might want to leave the transport to someone else. Additional Fees: Even if you think you know the cost of moving truck rental, you may not be considering all the fees, including fuel and insurance. Be sure you understand costs entirely when figuring out your budget and making your final decision. Liability: When you hire movers, they assume responsibility if things get damaged or broken. When you move things on your own, you are responsible for making sure items make the trip in one piece. Additionally, you assume liability for the moving truck, which for some people, is a terrifying proposition. Security: While you may feel like you have more control of your things with a DIY move, remember that moving trucks are prime targets for theft. You’ll need to think through the logistics of keeping the truck safe in hotel parking lots and rest stops along the way. Instead of renting a moving truck, you might choose to rent a trailer and tow it behind your vehicle. Trailers come in all shapes and sizes but are almost always more affordable than a truck. Consider how many belongings you have and if cargo trailers could be the best way to move them. Loading Perks: It may be easier to load items on and off a trailer, since it is closer to the ground, and you won’t need a ramp or extra tools for loading. Ideal for Small Moves: Cargo trailers are perfect if you don’t have a lot to move. For small loads, like the contents of a studio apartment or a dorm room, a trailer likely can haul everything. Cheap: Trailers cost less to rent than moving trucks and are certainly more affordable than hiring movers! Weather: What kind of weather will you be venturing through during the move? If you plan to rent an open trailer, you may want to bring a tarp and some ties in case of rain. To be even safer, rent an enclosed trailer. Doesn’t Fit Much: While an excellent option for those who travel light, a trailer just won’t cut it for those moving a large amount of stuff. If you’re moving out of a 2-bedroom or larger home, you probably need to stick with hiring movers or renting a full-size truck. Towing: Do you have the appropriate vehicle for pulling a trailer? Before you sign the rental agreement, make sure your car or truck is compatible with the specs. Also, make sure that you are entirely comfortable with towing a trailer before you hit the open road. A moving container is another viable option if you don’t like the idea of a trailer or van. Convenience: Moving container companies are very accommodating. They bring you the container and then transport it to your desired destination. Storage Options: A moving container is multi-purpose. If you want to keep anything in it for a while, you have the option to rent the portable storage unit for an extended time. Moving pod companies will also pick-up and deliver your container to a secure facility if you don’t have somewhere on-site to park it for an extended time. Extra Time: You will have more time to unload and sort your items. If you prefer to keep that container at your house for a month or more, most companies are happy to set you up. Cost: In many cases, moving containers cost more than renting trucks or trailers. Do the math before committing. Decreased Control: With having more help with your journey, you will also have less control over your possessions. If your moving container company is transporting your items or has them locked up, you won’t have constant access to them. Loading and Unloading: While the container company does the driving, you are still responsible for the manual labor of loading and unloading it. Restrictions: If you live in a neighborhood with an HOA or a city that cracks down on parking laws, you may run into issues with using a moving container. Make sure you check local regulations to find out if containers are allowed in your area. Of course, hiring a national moving company can be more expensive than any of the above DIY options. But if you factor in your time, stress levels, and the overall burden of the move, you might get the most bang for your buck from the real experts. Efficiency: Moving takes lots of time. Hiring an all-in-one moving company frees up your time to focus on other important aspects of your relocation. Lesser chance of injury: Unlike with the other moving options, you won’t have to do any of the heavy lifting. Your professional moving crew will come equipped with the personnel and the equipment to carry all the furniture, appliances, and heavy boxes. Insurance protection: Interstate movers bear the responsibility for making sure your items are safe from the start of the move until the last box is off the truck. Reduced stress: A long distance move is always stressful, no matter how prepared you are. Hiring movers takes some of the burden, and the consequent anxiety, off your shoulders. Expense: For most people, the biggest concern when hiring a moving company is the cost. Though it’s typically a little pricier than some of the other relocation options, it may not be as expensive as you think. Great Guys Long Distance Movers allows you to compare quotes from multiple nationwide moving companies in one place so that you can make an informed decision! Car transport services: National auto shipping services offer convenience and save you miles on the odometer. Explore open and enclosed carriers to find the option that suits you best. Professional driver: Hire a pro driver through a qualified company. This strategy can help you transport pets and personal belongings as well. You can find great drivers through driving companies or nationwide movers. Friend or family driver: Is there someone you know and trust to drive your vehicle? Consider paying them to drive your car for you, then find an affordable way for them to get home. Be sure to find a method that puts you at ease. Insurance and certification are a must! Find trusted movers for a stress-free move. Fill out the form or text for a quick response. Cheaper pricing. Quality services. Happiest customers. According to Home Advisor, the average cost of a national move is about $3,500. However, the cost of a relocation varies depending on the size of your home, how much you are moving, and how far you’re going. Your final price also depends on which moving services you need. Select a nationwide mover who prioritizes your 1) your unique needs and 2) your budget. Look for a moving company that is insured, experienced, and legitimate. When you are making up your budget and preparing for your move, here are some of the costs you should factor in. Hotels: Think through the logistics of your move. Maybe you will need a hotel while you are traveling, or you might need one while waiting on your permanent home to be ready. Gas: How much will it cost you to drive one or more vehicles across the country? Are you renting a truck? Don’t forget to calculate gas for that as well. Airfare: If anyone is flying, factor in this cost. Meals: You will need meals both during the transportation process and shortly after the move. You will be eating out more and should plan accordingly. Pocket change: Don’t forget about extras on the road trip, like tolls, snacks at gas stations, and emergencies. Movers, truck or trailer: How are you getting your goods cross-country? Whether this service is through a professional national mover, a rental company, or a moving container company, this will be one of your significant expenses. Moving fee: If you have the professionals assisting you, how much will they charge you for the actual transport of your goods? What will it cost for fuel, time, and labor? Insurance: Don’t forget about insurance costs. You may receive coverage from your nationwide movers, purchase a 3rd party policy or add on to your auto coverage for driving a rental. Loading and unloading: What will your movers charge to load and unload your goods, based on their weight and volume? Packing and unpacking: Will you be hiring help for the packing and unpacking process to make it as efficient as possible? If you are packing and unpacking DIY, you will still be purchasing packing materials. Add up total packing costs. You can save on packing supplies by talking to anyone you know who has recently moved or posting a request for used materials on social media. Professional cleaners: Deep cleaning is a part of moving. Consider whether you need assistance cleaning your old or new place, or both. If you are hiring help in this area, include these costs in your moving budget. Add-on moving services: Your relocation specialists offer a wide range of incredibly helpful services. If your movers will assist you with other needs like assembly or installations, factor in these costs. Equipment rentals: If you are renting a truck or a container, you will likely need to rent gear like dollies and moving blankets. Vehicle shipping: If you are paying to transport one or more vehicles, this can add a significant amount to your total. You may want to consider asking trusted family members or friends to help get the car to its destination instead. Storage charges: Will you be storing anything long-term? Consider the costs of getting these items packed up and stored away properly, as well as the base cost of the storage unit rental. Don’t forget little expenditures like security deposits, heavy duty locks, etc. Child or pet care: It is safest to have your pets and kids out of the way on moving day. You might also need help with care shortly after arriving at your new home as you unpack. Don’t forget about other expenses like pet hotels. Real estate: If you consider this part of your moving costs, this is a big one. Consider the expense of security deposits, down payments, closing contract costs, real estate agent payments, and home repairs. Time off: Will you need to take time off work to get the cross-country move done right? Consider any downtime between paychecks. New furniture: What will you need to settle into your new home? Furnishing a new place is a significant part of your final cost. Installations and utilities: From a change in service fees to utility company deposits, consider these expenses in your cross-country move budget. It may make you feel nervous to see this long list of potential costs but remember that you probably won’t encounter all of these during your move. Invest in what it takes to make the process smooth and doable because your health and safety are the most important factors to consider when moving. The movers in our network offer a diverse menu of helpful services to get you across the country seamlessly. Look into your budget and the tasks at hand to decide which moving services will be most beneficial to you. Nationwide moving companies are happy to answer all your questions about any of their add-on services. Here are just a few examples of moving services that Great Guys Long Distance Movers’ professionals can provide. If you are moving between apartments or small homes, the professionals can still lighten your load. Small moves are deceptively tricky because they often include staircases, narrow hallways, and navigating other tenants. They can also be difficult because you do not want to pay a large mover or rent an oversized truck when your needs are lesser. Our small move experts will provide the right equipment to get the job done at a better price. Nationwide small load movers can move all your things carefully, making your move a breeze, while only charging you for what you need. Did you know your moving company can provide you with affordable supplies? This perk of working with a professional means extra savings. Nationwide relocation specialists know what materials you need to get the job done right and how to protect your belongings. Your national movers can give you the professional materials they use at a fraction of the price you might pay otherwise. Some moving services even deliver your packing materials right to your door. Ask your experts more about how they can help you with the packing and unpacking process. Our nationwide furniture movers can move any piece of furniture with ease. They have experience with furniture of every kind – from armoires to oversized sectionals. They take care of every item and protect your belongings with moving insurance. Your movers will use high-quality packing materials while moving your furniture to prevent bumps and scrapes. They will also arrange furniture in your new home, placing each item exactly where you want it. Not to worry, they also handle the post-move cleanup. Moving a piano is a tricky to-do, but qualified professionals have the skillset to do it the right way. Piano moving experts understand the delicate nature and value of your instrument, and they know the proper techniques to move it, safety guaranteed. Fill your movers in on the specifics of your instrument and voice your concerns. They will bring the right equipment to get your piano to your new home without a scratch. When you’re traveling from point A to point B, you may have multiple vehicles to bring with you. Ask your movers about vehicle transport options. Many moving companies offer enclosed or open truck transport to save you the hassle of driving. Car transport and storage services extend to vehicles of all varieties, including RVs, luxury cars, snowmobiles, and even off-road vehicles! We understand that residential moves can be hectic, and at times, too much stress for the individuals or families involved. When you hire a licensed residential mover, rest assured that your belongings are in good hands. They use the best materials and techniques to move your valued items with care. They’ll also listen carefully to accommodate your preferences and specifications. Our commercial moving experts are trained to manage most kinds of products and equipment. Your business assets are precious, so they take the proper measures to get them safely to your new office. Our network of business movers offers flexible services. They provide cost-effective methods and solutions for your moving concerns. Contact our professionals to find out more about moving your business long distance. If you have the budget, consider hiring a full-service moving company to ease your load. Work with your mover to customize your relocation, choosing the services that are most useful to you. When you select full-service movers, you won’t have to lift a finger. You can guide your movers as much or as little as you like throughout the process. They do everything according to your instructions. Whether you have too much on your plate or would like a stress-free move, our full-service movers work hard to ensure you have the best relocation possible. Moving appliances isn’t easy. Appliance movers give you the muscle and expertise you need to take hauling those appliances off your hands. They can even get them booted up and ready to go in your new home! Our experts know how to prepare and move each utility safely. Washers, dryers, refrigerators, and more can all be ready and waiting for you in your new place. Pool tables require expert hands and proper tools to move without damage. Whether they encounter a set of stairs or tight corners, our pool table experts know what to do. They remove the legs, rails, pockets, felt, and slate carefully, then wrap them up, ensuring every piece makes it to your new home. You don’t want to take any chances with your cherished art pieces. Our network of art moving experts has the appropriate knowledge to load, secure, transport, and deliver your precious artwork without incident. Light or heavy, bulky or unwieldy, find a custom solution for transporting your paintings and sculptures. You can use our 2-month national moving checklist to design your unique relocation timeline. We hope it serves you well throughout your move! Are you taking the plunge and relocating nationwide? Moving to California, Florida, or New York? No matter where you’re going, do your research. Look into your community, search for housing, and seek out new medical services. What are some of the most important considerations as you choose your new home? Think about safety, schools, childcare, and community locations you will frequently be visiting. Hire a realtor or enlist friends and family in your new area for help. Whenever possible, visit your new area. Schedule some house or apartment showings and take the time to drive around and even talk to potential neighbors. In addition to researching your new home, you should also be researching moving companies. But before you can hire anyone, you will need a complete budget. You can research what to expect from your move online, including standard costs so you can compile a budget. You will need a budget so you can determine which services you want to hire out and which tasks you’ll tackle yourself. Ask friends and family who have moved in the past year or so about their relocation budget. Be detailed and complete with your budget. Get a feel for what you can afford to spend before you begin collecting quotes. By organizing your home, you can get a better idea of how much work will be involved in your move. The idea of this initial organization is deciding what you will sell, donate, or take with you. Consider your new place and your old place, the layout, the expense of moving, and what you need and use. This step will help you prepare for an in-home estimator to come to your place, as you can have a better feel for how much the national moving company will transport. Plan for how to sell your belongings. You even start tossing things or donating them. Of course, organizing your home also includes ending contracts or putting it up for sale if you have not already done so. To provide an accurate list of household items to your moving company, make an inventory list. Include furniture pieces, as well as a basic list of how you will organize your boxes. Most importantly, include those items which are most valuable or important to you. Don’t forget about those sneaky items hiding in the garage, closet, or attic! Once you’ve completed the first four items on the list, you’re ready to start requesting moving quotes! Great Guys Long Distance Movers takes your information and finds you a list of nationwide moving companies that are licensed, insured, and able to handle your move. Once you receive initial ballpark estimates from these movers, you can request in-home estimates to refine the quote further. Of course, it’s time to work out the finer details of your new home or apartment. Schedule any necessary repairs in your current home or new home. Square everything away as far as selling your old place or terminating contracts and getting into your new home. If you have children, get them enrolled in their new schools. In a similar vein, don’t forget to let anyone important know about your move. Let doctors, therapists, teachers, instructors, friends, work, friends, and family know you will be leaving, and set up new accommodations in your community for when you arrive. Be sure to put your most important belongings in a safe spot at the start of your move, before things become completely chaotic. Place important documents and belongings their box and set it somewhere special. Mark it and label it boldly so your movers or loved ones will not donate or throw it away by accident. Put your “important belongings” box somewhere you will remember to bring it with you on moving day! It’s time to take the data you’ve collected and hire your national moving company. Make sure it is licensed, vetted, and insured. Then, give them a call and set your moving date in stone. Settle on all the services you will be hiring them for and sign any contracts necessary. If you need storage or other services come moving day, such as auto transport, reserve those as well. Childcare and pet care for moving day may also be critical. Now that you know your move-out and move-in dates, you can call your electric, cable, internet, and other utility providers. Let them know you will only need service through your move-out date. Call and set up services in your new area as well, to begin the day before you move in, so everything will be ready for you once you arrive. You’re organized enough now to begin packing, but first, you will need some materials. You can get discount moving supplies from your movers, friends and family, hardware stores, etc. You can compare prices and buy online or call around to local stores to see if they will provide anything for free or at a discounted rate. When your materials arrive, it’s time to start packing. Begin with those non-essential items such as books and memorabilia. Other people choose to start in their least-entered rooms, like an office or guest room. Don’t postpone trying to sell that furniture, those electronics, and other things you don’t plan to bring with you. If you haven’t placed them for sale already, it’s time to do so. You can sell furniture and electronics online or with phone apps. How do you plan to use up the rest of your food before moving? Now is the time to plan out how you will consume or donate the remainder of your grub. The goal is to lighten up your move and waste as little as possible! Before you make that cross-country drive, get your vehicle ready to go. Check fluid levels and tires, making sure the car is in top shape. Start saying goodbye to family and friends. Things will get a little crazy in the last week or two before the move, so schedule lunches and meetings at your favorite places and with your favorite people now. Make up a box or suitcase of things you will need in the first few days in your new home. You may want to include your travel belongings or create a separate travel bag. As you find things that you will need in your first days at your new place, such as shower curtains, towels, nonperishable snacks, and important papers and medications, begin collecting them in your “first days” box. Set it aside and label it appropriately. Work hard to stay on a packing schedule. Don’t get too behind, or else those last few days will feel impossible. Ask for help for anyone involved in the move, make assignments, and work on packing daily. File your change of address with the US Postal Service, so your mail forwards to the right place. The easiest way to do so is online at usps.com. If you haven’t yet, notify your insurance company about your move, and contact credit card companies. Don’t forget to explore your options banking options and make sure you have a branch in your new location that’s readily accessible. Talk with your financial institutions and let them know you will have transactions in a new location. If you need to move any money around, do that now. What other monthly memberships or subscriptions do you have? It’s time to cancel that gym membership, those magazine subscriptions, and other regular services before you hit the road. Bringing clean and fresh laundry to your new home is optimal. Start taking down and washing things like drapes, bedding, rugs, and all your clothes, and then pack them up. While you pack fervently, assess your remaining to-dos before the move. If you need more help, ask your moving company or loved ones to step in and assist. Look over your travel schedule. Make sure everyone involved is well aware of what will be happening on moving day. Even if you think they know, remind them! Ensure airplane tickets are for the right times and dates, and that you have transport to and from the airport. Check up on childcare or pet care. Discuss driving plans with drivers and confirm movers and auto transport. If you are meeting a landlord for a key in your new location, set that up. If you do not have a suitcase packed up for air or road travel, put one together. Don’t forget your “first days” box or suitcase if it is coming with you. Determine what items (such as valuable jewelry) should stay with you during travel, and what you can leave on the moving truck. You will need to drain, defrost, unplug, clean or otherwise prepare your appliances for transport. Disassembly may also be necessary. You’ll be packing up those last rooms now. Make sure you are completing some deep cleaning as you go. If you think you will run out of time to do things like cleaning appliances, wiping down the walls, and vacuuming the carpets, you may want to consider a professional cleaning service. Carve out some time to hold a yard sale and take a trip or two to your local donation center. If you still have belongings up for sale online or on selling apps, lower the prices to speed up the sale. Have a viable plan for what you are going to do with the belongings if they do not sell in time. Before your movers come, organize your boxes and belongings in a way that will help both you and the movers. Write down any notes you want to mention to the movers, and consider how you want your professionals to organize, load, and unload. Clear paths that allow the movers to navigate easily. Some people prefer to keep all their moving boxes in a single room. You will need cash to tip movers, as well as cash for emergencies during travel. If your credit cards fail you for whatever reason, you will have a backup plan! It’s time to break down all that furniture. We know it can be a hefty task, depending on how much furniture you are bringing with you, so enlist help. Your moving company can also perform this task for you if you choose to hire them to do so. Keep bolts and pieces in clear bags taped securely to the furniture itself. Finish packing up those last boxes, because moving day is almost here! If you are driving, load up as much as you can in your car. If you are flying, check in for your flight 24 hours before takeoff. Make sure your home is ready for its new tenants. Check for items that you might have left behind. Search under beds and in those high cupboards. Make your home look nice while the boxes are removed but stay out of the way of your nationwide professionals. You may want to involve your landlord in the process so you can clean up anything they are dissatisfied with, especially if there is a cleaning deposit on the line. Turn off lights and thermostats. Lock the windows and doors. Make sure all faucets are turned off. Ensure the tenants or owners have access to house keys, mail keys, etc. Travel safely and enjoy exploring your new home! Here is where that inventory list you made comes in! Check off all belongings that made it safely to your home, especially those valuable and frequently-used ones. Take the time to guarantee every box and furniture piece has arrived at your home. Look all your things over to confirm no new damage has occurred. You may want to have your new residence professionally cleaned, or you might want to deep-clean it yourself. When it’s all cleaned out, and you feel comfortable, it’s ready to be unpacked! If you see any damage to any of your belongings, or you are positive something has gone missing during the move, make your claims sooner rather than later with your moving company. There is a time limit on making insurance claims. Most national moving companies are very considerate and accommodating when it comes to claims. If you have recently purchased a home, you are probably already aware of anything that is in bad shape. You may want to schedule or work on repairs before you settle into the place. If you’re renting, walk through your home or apartment, looking for leaks, clogged plugs, and other damage. Complete a list for your landlord, so they know what problems existed before you arrived. Then, arrange to get things fixed up. Think about what you use the most, or which belongings are the most critical in your daily life. We recommend setting up those beds first so you can get some much-deserved sleep. Then you might want to set up TVs, couches, and your dining table. Don’t forget to hang shower curtains and pull out that special box you prepared for these first few days in your new home. You’ll have to register your vehicle(s) and get a driver license in your new state. Don’t forget to register to vote and change any other important records. Now it’s time to drive around and visit your local grocery store and hardware stores as you make your house or apartment a home. Research community activities, visit new schools and workplaces, and get excited about this life change! You don’t have to unpack everything overnight. Unpack a few important boxes and get an idea in your mind of how quickly you will unpack the rest of your boxes. Your unpacking schedule may depend on when you return to work and how much help you have. Most importantly, you have finished the hard work, and you deserve to sit back relax. Remember, if you need help with tackling your move, Great Guys Long Distance Movers has already done the hard work of vetting nationwide moving companies. Get your free moving quotes now!